As a first step to contribute to this year's iGEM competition we decided to participate in iGEM's fourth International Interlaboratory Study along with many other teams from around the world. This study is organized by iGEM's measurement committee in an effort to establish standardized, reliable and repeatable measurement tools for the iGEM community and the synthetic biology community as a whole. This year's iGEM InterLab study is about establishing a standardized protocol for the measurement of GFP using a plate reader. To start things off we needed a plate reader that is qualified to measure GFP fluorescence. Namely, Tecan Infinite M200 Pro plate reader. Additionally, we needed competent E.coli DH5α. These were prepared from glycerol stocks. Together with the material iGEM had provided we were ready for work. 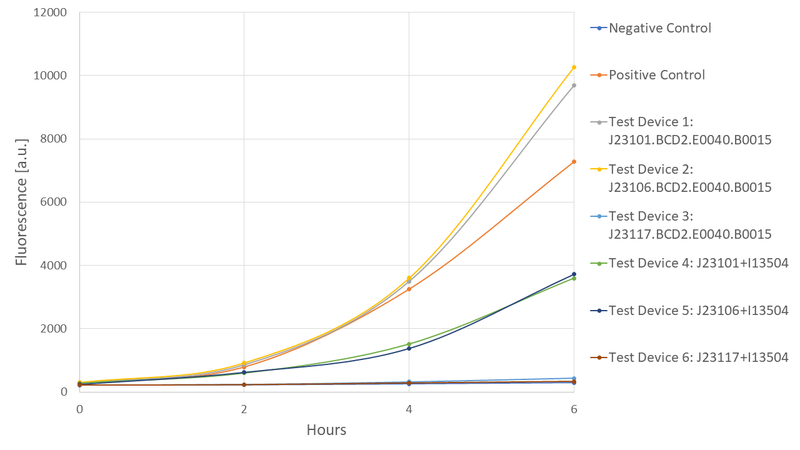 Throughout our experiments, we tested 8 plasmids (2 controls and 6 test devices) by measuring the OD600 and the fluorescence of the cells carrying the constructs. The workflow can be separated into four segments. The first segment is the transformation of all plasmids into competent DH5α cells. The transformation was successful for all the plasmids and resulted in a sufficient amount of colonies on all plates. Therefore, two colonies from each plate were picked and inoculated in LB medium containing chloramphenicol overnight for approximately 16-18 hours at 37°C and 220 rpm. The second segment is the measurement of the LUDOX-HS40 solution to obtain a ratiometric conversion factor which allows us to transform the absorbance data into a standard OD600 measurement. This is necessary because plate readers, in general, do not have a 1 cm path length which means that measurements are volume dependent. By doing so, we obtained following data. Table 1: With these replicates measured, we obtained a ratiometric conversion factor of 4.30 for our specific plate reader when measured 100 μL of the provided LUDOX-HS40 to water. 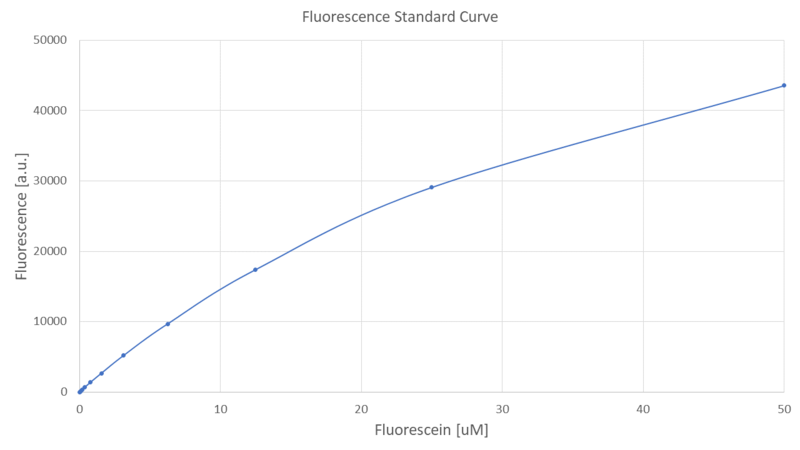 In the third segment, we were instructed to measure a standard curve for fluorescence of Fluorescein which can be used to correct our cell-based readings to an equivalent Fluorescein concentration. Following the instructions, we could obtain following results for the serial dilution of Fluorescein in phosphate buffered saline. These data give us an approximate linear regression line when plotted on a logarithmic scale and show an expected exponential course when plotted in a linear form. In the last of the four segments, the OD600 and the fluorescence of the transformed cells were measured according to the protocol after 0, 2, 4 and 6 hours. Measurements of all these time points gave us the following data and calculations which were conducted with the values we obtained from the standard curves and the reference point. Hour 0: Replicate 1 Replicate 2 Replicate 3 Replicate 4 Replicate 1 Replicate 2 Replicate 3 Replicate 4 Replicate 1 Replicate 2 Replicate 3 Replicate 4 Arith. Mean Arith. Std.Dev. Geo. Mean Geo. Std. Dev. The protocol was easy to follow and the constructs were nicely expressed which allowed reliable and comparable measurements. In the process of obtaining transformed DH5α cells we did not encounter any problems with transformation as bacteria showed exceptional growth. The specific ratiometric conversion factor of our plate reader could be determined without further adjustments using the LUDOX-HS40 solution. 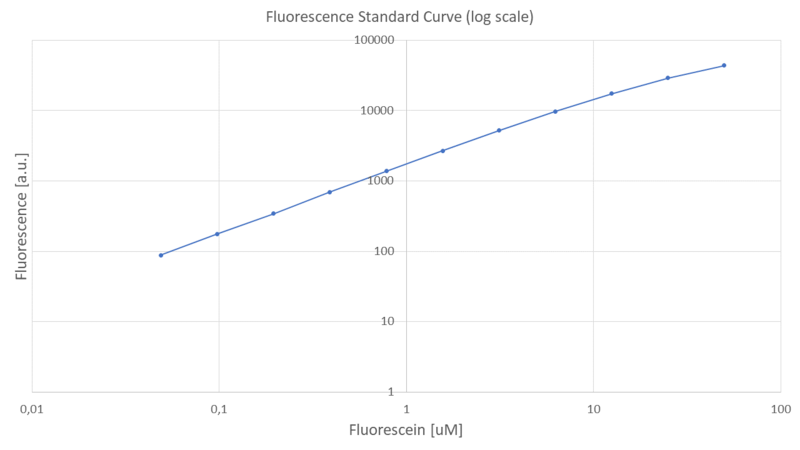 When measuring the Fluorescein standard curve on a logarithmic scale the data points showed a linear distribution. The final step, the measurement of the fluorescence emission and optical density of the cells, resulted in the raw data shown in table 1.5. 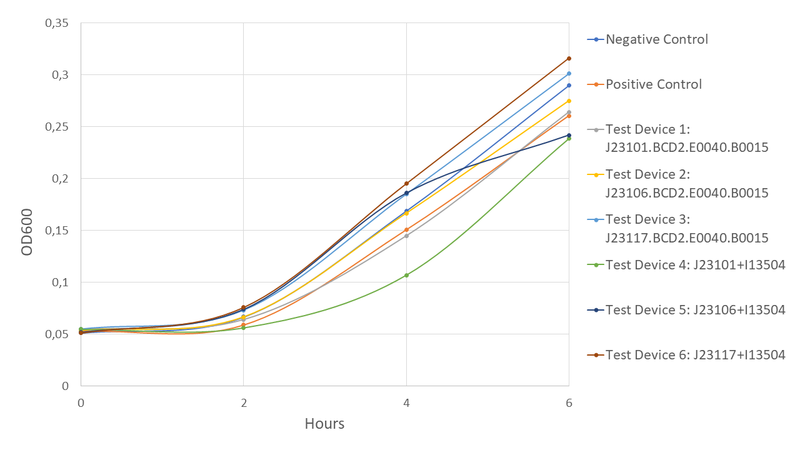 To make this data visually accessible the mean values for OD and fluorescence were calculated and plotted against their respective time points which are seen in the following graphs. Conclusively, these data suggest that the Interlab study was successful and that the provided protocol can be shared in the community for standardized fluorescence measurement with a plate reader.